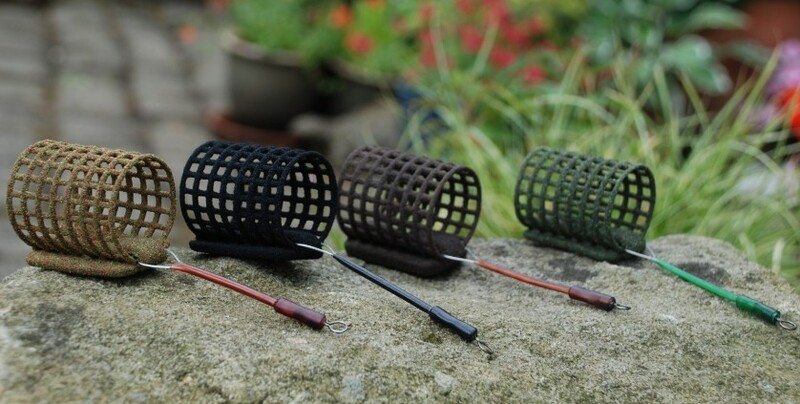 Swimfeeders are designed to get loose feed on to the riverbed right next to your hookbait. They can be fished either on a running setup, semi-fixed or paternoster. Whichever set up you use, always make sure that is fish friendly. In other words, if you hook a fish and then get snagged or smashed up, you don’t leave a heavy weight attached to the fish to carry around with it. Make sure that either the feeder can come free, or if using a paternoster, that your hooklink is weaker than your paternoster link. This way you should always break at the hooklink and not the mainline above the weight or feeder. As you can see from the diagram, the blockend feeder is closed at both ends. The cap at one end can be removed to fill the feeder with bait. 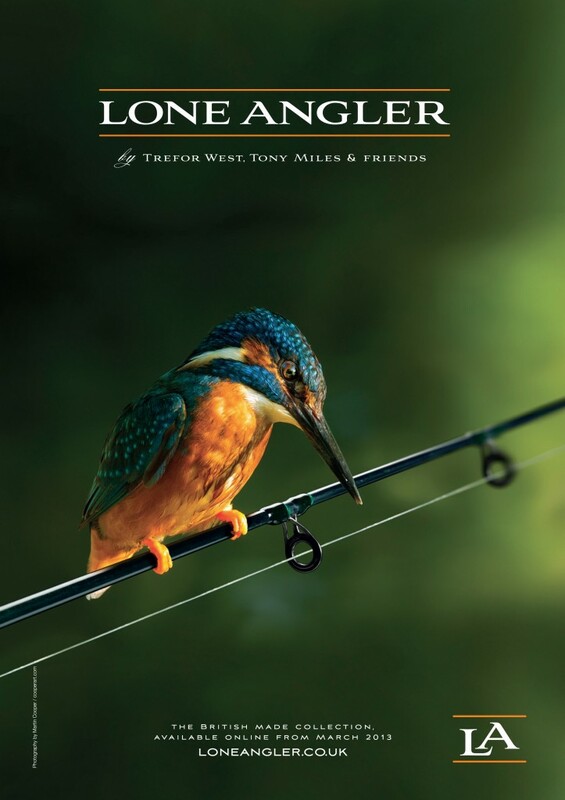 They are designed to be filled with bait like maggots, casters and hemp, the types of baits that can either wriggle out or be carried out slowly by the current. There are a number of styles of blockend feeders including inline ones available, however they are essentially all the same. They are available in a number of sizes, with each size offered in a different weight. You can buy small clip on weights to customize your feeders further and you can also enlarge the holes to release the bait from the feeder at a faster rate. You may even wish to tape up or block some of the holes if you require a much slower bait release. 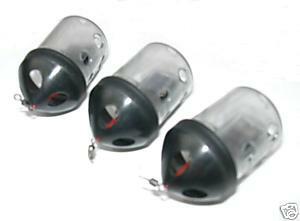 These are designed to be filled with any loose feed of choice and then capped at either end with groundbait. Alternatively they can just be filled with a coarse groundbait and pellet mixture. Once on the riverbed the groundbait starts to breakdown and releases the feeder’s contents. After a few minutes of casting out, a turn or two on the reel handle should pull the hookbait right into the groundbait released from your feeder. Unlike the blockend feeder, any bait can be placed in to the open end feeder, making loose feed choice almost endless. There are many styles of open end feeder available including, cage feeders, gripmesh feeders and pellet feeders. So for instance, if you are using breadmash, then a cage feeder would be the ideal choice, perhaps one that is made of gripmesh. This has lots of small spikes lining the inside of the feeder, designed to grip the contents. A soft, runny bait like breadmash is then held in place during the cast. Unlike many of the open end feeders, this type does not require plugging at either end. A feeder designed to have groundbait squeezed on to it. The feeder itself is essentially a frame with a swivel at the end. It is generally fished bolt-rig style. There are now in-line versions available. 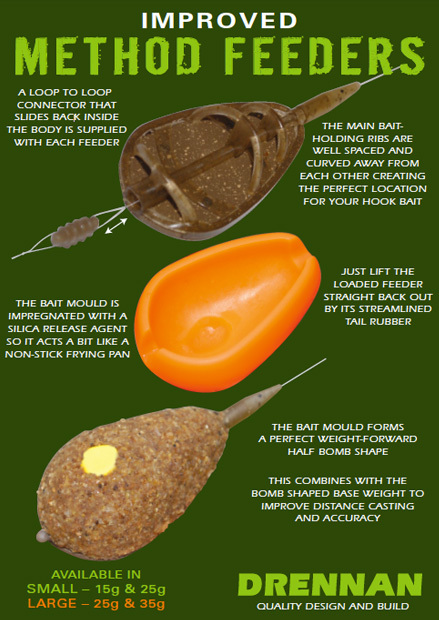 The method is quite simple – squeeze your groundbait plus your hookbait on to the feeder into a ball. This means that your hookbait is basically buried in the groundbait. Any fish feeding on the groundbait will inevitably pick up your hookbait.